Shop for authentic Grenada Flags. We offer indoor and outdoor Grenada flags in durable nylon. Our outdoor flags are finished with a canvas heading, while indoor flags are finished with a lined pole hem and your choice of with or without fringe. 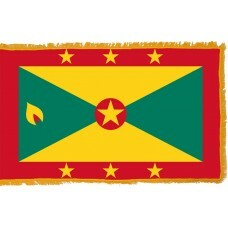 We also offer indoor and outdoor Grenada flag sets. The Flag of Grenada was adopted after it gained independence from the United Kingdom in 1974. It consists of three colors - green, red and gold. These colors are used to represent the country's vegetation and agriculture (green), courage and vitality (red), and wisdom and warmth (gold). This flag has a red border in which three gold stars are equally spaced along the top and three gold stars equally spaced along the bottom and they represent the six parishes of the country. There is a further gold star which is placed in the center of the flag, surrounded by a red circle and this stands for the capital of Saint Georges. Two gold triangles, one top and bottom and two green triangles, one left and one right form a rectangle which is the main background of the flag. Within the green triangle on the left is a yellow and red symbol which represents a nutmeg which grows all over the island along with many other spices, hence a link to the name is given to this former colony of "Isle of Spice", spices being one of its main exports. Mr Anthony C. George who comes from the town of Soubise in the Parish of St Andrew's designed the flag. 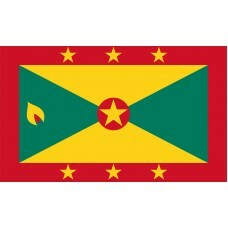 It is believed the name Grenada originates from the time that the French colonized the country and called it La Grenade. They had control of Grenada for about one hundred years and prospered from it by exporting sugar. Control was then passed to the British for the next two centuries and they continued to build the country's prosperity by adding the export of spices. Today the Grenadian economy is mainly dependent on tourism. Like many Caribbean islands it has beautiful beaches and picturesque bays and harbors for visitors to enjoy. It's lush green interior features a number of waterfalls and probably most famously a crater-formed lake called Grand Etang Lake which tourists can see when visiting the Grand Etang National Park. If you are visiting Grenada you must experience what the island is renowned for, it's spices, in particular, nutmeg. A visit to the Dougaldston Spice Estate which is one of the largest and oldest plantations on the island is where the locals will demonstrate how nutmeg has been grown and processed for centuries to make Grenada one of the top producers in the world of this spice. Being located in the south east of the Caribbean, Grenada's hurricanes generally do not cause severe damage, but the country did receive a direct hit from Hurricane Ivan in September 2004 having been free of hurricanes for the previous 49 years. The damage caused was horrific with about 90 percent of homes damaged or destroyed. Due to the determination of the citizens, international finance and action from the Grenadian government the island recovered well and was ready for business again in just over a year proving the worth of the red on the Grenada flag representing the courage, fervour and vitality of the people to preserve and maintain this small island nation.